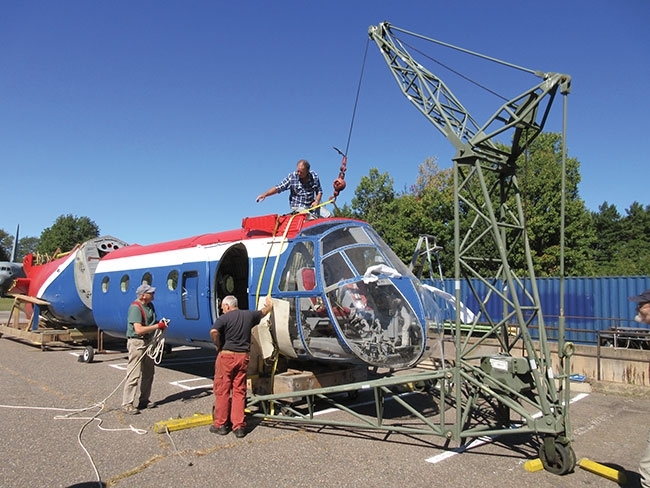 After five years of work, the restoration team at the Greenwood Military Aviation Museum rolled the forward and rear fuselage sections of a Piasecki/Vertol H-21/H-44 twin-rotor helicopter out of the workshop, bolted them together and moved it onto its newly poured display pad this October. Joining the front and rear fuselage. It is a fine acquisition for the museum, which has only one other helicopter on display – a CH-113 Labrador. Also, it was a homecoming of sorts, as this machine, serial number 9592, saw duty at CFB Greenwood in Nova Scotia in the 1950s with 103 Rescue Unit. The Reynolds Heritage Preservation Foundation in Wetaskiwin, Alberta, donated the machine and the museum trucked it home in 2013. The restoration work began that fall. 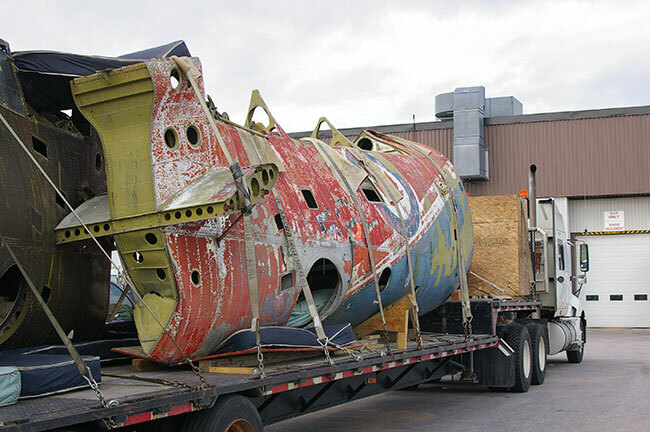 Because an accident had destroyed the forward section of the H-44 during a mid-seventies sojourn in Northern Canada, making it unfit for restoration, the restoration team used the front fuselage from a US Army H-21C airframe. To render it faithful to the 9592, restorers modified it to have the access panel, life raft and survival gear storage particular to the Canadian version of the H-44. The restoration team salvaged other cockpit pieces and an external hoist from the remains of an H-21B USAF airframe. Other parts for the rebuild came from the Reynolds Heritage Preservation Foundation. In a stroke of good fortune the restorers located some old stock of Perspex, which they trimmed down to build window panes for the nose. They completely disassembled and refurbished the nose gear. Other work included stripping out and remanufacturing floor sections, and dismantling and refurbishing the main rotor heads, which are now able to move. The H-44, which the restorers painted to its 103 Rescue Unit red, white and blue colour scheme, is still missing an engine. Whether the restoration team should hold out for one that is true to the H-44, or use a Cyclone engine that is similar, if not true, should one come up for grabs, is grist for interesting discussions amongst the restoration team. “They added some valid arguments to have any suitable engine installed. In particular, they want to be able to open up the engine panels/cowls to visitors during special events to display the engine mounted in the aircraft,” Baillie says. The mandate of the Greenwood Military Aviation Museum is to collect and show aircraft and artifacts used at CFB Greenwood, or at least examples of the types that were used there. One of 14 aircraft the museum owns, the H-44 brings will be one of 10 that are on display outdoors. They leave visitors no doubt they have arrived at the right place, which is just a few metres away from the 14 Wing guardhouse. The H-44 joins the one other helicopter on display, like the CH-113, with the signature double reverse lightning bolt. It flew out of Greenwood from 1991 to 2002, when it was replaced by the CH-149 Cormorant. Other aircraft in the collection include a Lancaster, Neptune, Arcturus, Hercules and a Dakota, all of which look huge on the compact, roughly amphitheatre-shaped museum lawn. An Argus sub hunter, which rattled windows as they clawed for altitude above the houses beyond runway 08/26, guards one corner of the grounds. Visitors are likely to see its successor, the Aurora, roar into the sky over the museum, on a practice flight or heading off on an ocean patrol. For example, there are 58 paintings by the Greenwood Art Association, including portraits of airmen who served out of Greenwood. Over 200 tiny model airplanes built by Donald Lee – trained as a RCAF pilot during WWII and re-mustered as a flight engineer – and donated by his wife after his death in 1995, fill display cases just inside the entrance. The displays range from a write-up on the Royal Air Force Distinguished Flying Cross to a Rolls-Royce Nene 10 engine from a T-33. Nearby, a restored Sperwer unmanned aerial vehicle dangles from the ceiling, and below it, visitors can take a close look at its on-board camera and circuitry. In the newest section of the museum is an Avro Anson Mk II. Beside it, a photo display shows some details of how the museum volunteers restored this beautiful plane. They completed it in 2009 after five and a half years and 16,528 hours of work. Keeping it company is a Bolingbroke Mk IV-T that has been under restoration since 2009. There is information and memorabilia on the Wing Squadrons; e.g., the 405 Long Range Patrol Squadron, including its standard, the 415 Swordfish Squadron, and an active display of the 404 Buffalo Squadron. An 2/3 scale model of a Spitfire occupies a good chunk of prized floor space. For Grade Six students, the museum runs a Flight Education Program. Treats they will enjoy include a busy Search and Rescue corner featuring a large model of a Labrador, parachutes being used as shelters, and mannequins dressed in their SAR gear. Large action photographs, posters, models and SAR tools of the trade, such as a rescue basket, tell more of their story. Elsewhere, the students learn about an ejection seat, flight controls, engines and propellers, and how an air-dropped torpedo works.